Traffic is a big part of the Los Angeles lifestyle. (Too big.) Every single person who has ever driven in LA has imagined a scenario in which they controlled the flow of traffic or the traffic lights. 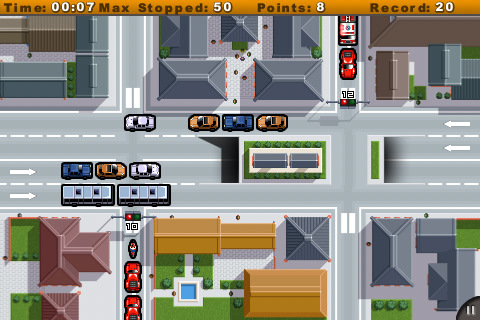 Perhaps Atinco’s game app, World Traffic, will help soothe your vehicular frustrations. The “world” part of the name stems from the fact that there are three levels to play in: Dubai, Beijing, and New York. Each city has a different difficulty level from Easy to Hard. Dubai, the easiest, has one set of traffic lights and two lanes; New York, the hardest, has three sets of lights and five lanes. Your job is to control the flow of traffic by starting and stopping the lights…the game is over if there is a collision. Watch the traffic going left to right, and tap the screen where the perpendicular lanes run (up and down the screen) to change the lights from red to green and vice versa. While the light is red and the cars idle in wait, a number will appear by the traffic lights. This number indicates how many cars are waiting at the light, and if they exceed the maximum amount (the first number on the top tool bar), the game is over. Of course, the more lanes there are, the more your attention will be divided. As befitting a car game, the soundtrack is exciting and easy on the ears (it consists of mostly trance, with some action flick-stylized background music). There are the quintessential car noises, such as honking and crashing, and oddly enough, beeping sounds whenever the cars pass the lights. The graphics aren’t particularly amazing (I mean, you really can’t tell the difference between the cities), but that is completely not the point of the game, anyway. While there is basically only one type of control, the gameplay is fast-paced and very engrossing, especially once you try the more difficult levels: your fingers must be quick and your mind able to split its attentions. World Traffic is a good pick-up-and-play app, and is available to you for just $0.99. Just please don’t play and drive. AppSafari review of World Traffic was written by Julie Guan on April 2nd, 2010 and categorized under Action, App Store, Fun, Games, Puzzler, Racing. Page viewed 4140 times, 1 so far today. Need help on using these apps? Please read the Help Page.